Happiness and misery are titles of all the experiences in life. The Star Wars movie series is a good example of the two contradicting experiences. You can join either the Jedi or the Dark Side. Unfortunately, many people live in the dark and are very unhappy with life. They find it hard to find friends, to succeed, to relate, to love, to grow or even to be healthy. The hard thing about living in the dark is that it gradually takes over. The more time you spend in the dark, the more light you need to come out of it. For many years, I have been writing about the quest for happiness and, as you may now, I believe that focusing on good is the best way to make it expand. However, there are (many) people who find negative examples more effective, so I am going to try some humor (taking a cue from my kids, who flattered me this month when I bought a funny birthday card and said I was developing my sense of humor) and talk a little bit about the dark side of life. Welcome to the Be Miserable in LIFE Misery Mastery training. When you have successfully qualified through just 10 steps, you will be awarded the very popular, highly sought after and totally depressing title of Misery Master. Presenting your title will immediately grant you access to unlimited compassion and sympathy from everyone around you, as well as their complete admiration for your achievement. Masters of Misery continually talk about the past. They can talk about the past longingly, as if there is nothing in the present that will ever get to “the way it was then”. They say, “When I was young…”, “In the old days…”, “If I could only go back to…” or “Those were the good old days”. It is very good to remember events from the past, but not to diminish what happens right now. People must believe their lives are getting better, unless they want to be miserable and keep trying to relive a feeling they will never have again. If you hear yourself using expressions that highlight the past and cast shadows of despair on the future, you have qualified through step 1 of your Misery Mastery. Masters in misery explain all their problems with things that happened in the past. They say, “It’s because my mom and dad…” (this is the most common), “Someone hurt me when I was young” or “I stopped doing it when I had the kids”. Masters in misery are excuse artists. They can come up with the best excuses for every small thing that does not work in their life. You probably have challenges with your health, your relationships, your work, your finance, your friendships, your motivation, your weight. Your probably cannot have some things you want and cannot do some things you wish you could do. When someone asks you why, ff you can quickly come up with a “reason” – you have passed step 2 of your Misery Mastery. Masters in misery can always foresee a dark future. They are great fortune-tellers whose visions always contain heartache, failure, disappointment, rejection, pain and hopelessness. They say, “I won’t be able to make it”, “It’s not going to be worth it, I’m telling you” or “I will lose that money”. Being negative about options makes those masters position themselves in a miserable spot that attracts negativity back. In time, this only strengthens their belief in a dark and sinister world. They use many “pink elephants” in their communication and talk a lot about what they do not want in life. If you can confidently predict your future will definitely go wrong, you are on the right track towards your Misery Mastery title and have just passed step 3. Masters of Misery are highly aware of other’s expectations and do everything in their power to please. They are able to put their desires aside and concentrate on other’s requests. They can take the kids to all their activities, keep the house spotless, stay late at work, come to family dinners, remember everyone’s important events, look like their partners want them to look, attend events they do not want to be in, study what they have never wanted to study and be extra polite with people they do not like because they are important to their mother. Pleasing others is so important to them, they make a lot of effort to fulfill even contradicting expectations. If you find yourself focusing on what others want from you most of the time, congratulations! You are well on your way to attaining Misery Mastery, having just completed step 4. Masters of Misery talk a lot about the things they want to do in life, but are unable to do right now. They say, “One day, I’ll have a big house”, “One day, I’m going to have lots of money” or “One day, I will travel the world”. Everything they want in life is filed under “one day”. Their “one day” file is so big they hardly get a chance to look at it, but they are proud of how big and thick it is and with their ability to wish for things. All of the Master of Misery’s hopes are stored in the “one day” file and gives them motivation to add more and more dreams and desires into the file. If you have a big “one day” file, remember: the more miserable you are, the thicker the file gets and the thicker the file is, the more miserable you are. This is a never-ending cycle, a guarantee for you to clear step 5 towards your Misery Mastery title. Masters of Misery do not try new things. They prefer to keep things the same. They love routines and repetitive situations they are familiar with. They spend time with people they know, eat food they are used to and live in the same house for years and years. Miserable people not take risks. They rather have less than go through a rough patch to have more. You can trust them to be focused on the well-known and the predictable. If you are very particular about keeping things just the way they have always been – keep up the good work. You have just finished step 6 of Misery Mastery. Maters of Misery can always see the green grass of their neighbors and envy them. They use others as a good way to find out what they do not have, what they will never have and then feel happily miserable about it. By the way, Masters of Misery know that everything others have or achieve has been acquired in some illegal or unethical way. They say, “He is filthy rich. Why can’t he give some to others?”, “He succeeded because he was never home” or “He had luck”. If you look at others and you want what they have badly, yet you think you can never get it because you are not willing to compromise your misery, great! This brings you to the end of step 7 of the Misery Mastery. Masters of Misery know that success in life is a question of luck. If you are lucky, you can make it. For them, all the successful people in the world had luck on their side when they succeeded. Such masters buy lottery tickets, participate in lucky draws and games of chance, follow luck-based TV shows and plan all their life around winning someday (“when I get lucky”). They know that what is needed is just a bit of luck and a winning attitude towards their prize ticket. If you buy lottery tickets and you just know your lucky turn will come one day (in fact, it is just around the corner, possible even this week), you have just advanced past step 8 of Misery Mastery. Masters of Misery are very loose with their time. They have all the time in the world to talk on the phone, to watch hours of TV or to procrastinate (“I’ll just see if I’ve got any emails”). They take time to do things and do not do things today if they can postpone them until tomorrow. They adopt the “What’s the rush?” attitude and solve problems when they appear, rather than planning ahead. They never say “No” to people asking them to do things, even if they do not have the time (see step 4), or they do not want to do those things, and they find time-saving technology and systems unnecessary. If you are also “surfing” through time, well done! You are nearly there, having just gone through step 9 of becoming a bona fide Misery Master. Masters in the art of Misery complete their training with the easiest skill, shifting all the responsibility to others. They concentrate on protecting themselves from complaints, disappointments and failure by finding the right to person to blame for it. They say, “If you hadn’t done this, I wouldn’t be upset”, “It’s all your fault”, “You should have done it differently”, “What?! You forgot to bring the picnic plates?”, “You nagged me so much I forgot to bring my mobile phone” or “You took all my time”. This way, they are free from trouble and pain. If you blame others for any trouble, difficulty and disappointment you have in life, you are at the top of the ladder. You have just successfully concluded step 10 of your Misery Mastery training and you deserve your Miserable Certificate. 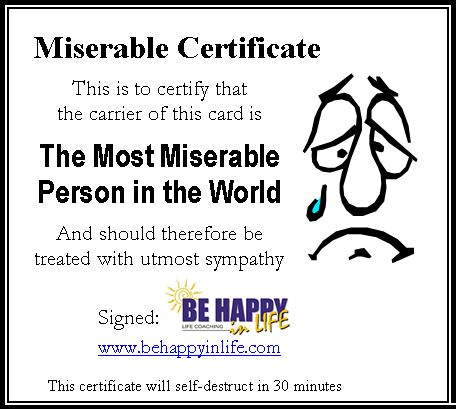 Please click this certificate, print it and use it whenever you need. Be aware, you can use it for 30 minutes at a time, after which it will self-destruct. You were right, I love it! Very well said! Ur pic is opposite with ur post heheheh. nice one.